As we age, the skin sags and becomes looser with aging. Lucia S. Olarte, MD is proud to offer Ultherapy, a non-invasive surgical procedure that can counteract these effects. Ultherapy is an ideal option for patients in Century City and Beverly Hills, Los Angeles, California, who want to tighten their skin without a facelift. Ultherapy utilizes the Ulthera® System, a revolutionary system that has adapted medical ultrasound techniques to address unmet needs in the aesthetic arena. The new groundbreaking technology, which is called DeepSEE™, combines ultrasound imaging with ultrasound therapy in a single “see and treat” device. This ingenious combination of ultrasound capabilities allows the user to achieve a non-invasive, thermal coagulative effect in the soft tissue with precision and consistency. During Ultherapy, Dr. Olarte gradually moves the flat surface of the ultrasound applicator over each region of the face. The sound waves deliver small, controlled amounts of energy into the deep layers of skin and soft tissue while sparing the upper layers. Localizing the layers of skin and soft tissue where collagen is most dense creates a directed neocollagenesis for improved skin tightening. Once the procedure is complete, the patient can return home. Ultrasound technology has been used on expectant mothers for decades and is well trusted by doctors. Ultherapy has an excellent safety profile, and most patients will experience no side effects or complications from this procedure. The FDA has cleared Ultherapy for use. Ultherapy is brief and non-invasive. Most treatments will be complete in under an hour. 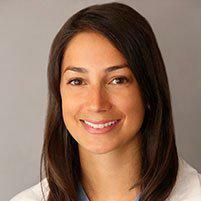 Dr. Olarte performs this procedure in the comfort of her office, and no hospitalization is required. After the procedure is over, you can return to your normal activities immediately. Is Ultherapy comparable to a facelift? Ultherapy won’t provide the exact same results as a facelift. However, it’s much less invasive. This makes Ultherapy an excellent alternative for patients who aren’t ready for a traditional facelift. Is Ultherapy right for everyone? Not every patient will be a good candidate for Ultherapy. Ultherapy is most appropriate in cases where the patient’s skin has begun to relax and feel less firm. For example, the eyelids may be sagging slightly or the brow line may have fallen. Most patients who opt for this procedure have mild to moderate skin laxity. Patients with severe skin laxity may need a traditional facelift procedure to achieve their desired results.